Earlier this week we introduced the June Hall of Fame nominations. As always, Rabin is back with his statistical analysis to help you with your vote. We have not looked at AIRS since November, but with this month going back to series, we go back to the original stat, along with Neutral AIRS. You can find the explanation for AIRS here and Neutral AIRS here. And here they are compared to all nominated series. Current nominees are in purple, inductees are in blue, and rejected nominees are in green. The rankings are out of a set of a bit more than 500 shows. We only have one nominee in the upper crust, but we also have nothing on the bottom. No nominee is lower than the lowest ranked inductee, Freaks and Geeks. One other thing to note is how poorly this month’s nominees rate in the Inspiration category, perhaps because as spinoffs themselves they are less likely to produce their own spinoffs. Let’s get started with the analysis. While many may not realize that The Andy Griffith Show is a spinoff of The Danny Thomas Show (which it ranks just above in AIRS), most should immediately see it as a Hall of Famer. Although never a huge awards draw, The Andy Griffith Show‘s legacy as a classic series ranks as high as any, with references made to it in even the most recent episodes of Arrested Development. The show’s ratings certainly help, as the show was in the top ten for seven seasons, including one year at #1. An easy yes. Lou Grant‘s award haul is impressive; it’s award score ranks first among nominees, 19th among all shows that have been scored, and second among all spinoffs, trailing only the already inducted Frasier (which ranks second among all shows, coincidentally behind only its own parent series, Cheers). Additionally only two series with as few episodes as Lou Grant rank ahead of it in AIRS (The Sopranos ranks 21st, Taxi, which also has 114 episodes, ranks 33rd). That is a significant part of the reason why Lou Grant takes a leap in Neutral AIRS, where it becomes a top 50 show, ranking right ahead of long-running spinoff launching king Law & Order. Also notably, Lou Grant ranks significantly ahead of both Rhoda and Phyllis, making it the leading The Mary Tyler Moore Show spinoff. It does, however, rank behind MTM, which is the highest ranking, eligible series in AIRS to not receive a nomination. With all that said, Lou Grant is a definite Hall of Famer. Laverne & Shirley is part of an enormous spinoff tree. It is one of six spinoffs from Happy Days, which is itself a spinoff of Love, American Style. But that is not all. Laverne & Shirley actually had two of its own animated spinoffs; first Laverne & Shirley in the Army, then the elegantly named The Mork & Mindy/Laverne & Shirley/Fonz Hour (which, despite the slashes, was actually only two joint animated series, one with Mork and Mindy and one with Laverne, Shirley, and the Fonz). All of this is irrelevant however, as taking away Laverne & Shirley‘s Inspiration points has no effect on the show’s ranking at 66. Instead it is the series’ ratings which push it to be as high as it is, with two seasons as TV’s #1 show, and two more in the top five. In fact, Laverne & Shirley is one of only eleven series and only five sitcoms in the sample with multiple seasons as the #1 show on television. It is also one of only four spinoffs to rank #1 overall in Nielsen ratings, along with parent series Happy Days, The Andy Griffith Show, and the most recent #1 show, NCIS. Interestingly, Laverne & Shirley is the lowest ranking show in AIRS and second lowest ranking in Neutral AIRS (behind Happy Days), of all series in the sample to rank #1 for at least a season. I don’t think popularity should be a deciding indicator for the Hall of Fame, but Laverne & Shirley‘s overall ranking should make it another yes vote. And if Laverne & Shirley is good enough statistically for the Hall of Fame, The Jeffersons probably should be as well. Although never #1, The Jeffersons did spend four seasons in the top ten, and with over 250 episodes it ranks just behind Laverne & Shirley in AIRS. 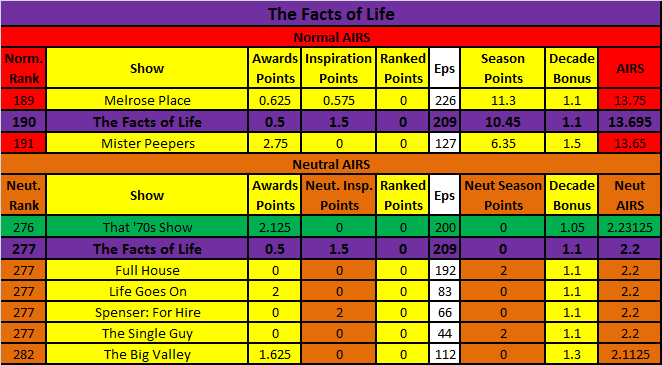 Without episodes factored in, however, The Jeffersons drops a bit in the neutral category, where is is in range with shows like Alice and Barney Miller, which are borderline cases, and below less-beloved shows like Mad About You. This is nearing the borderline, but I’d say it is another yes. The Facts of Life ran for a long time, and that props up its ranking (which is why it ranks just below a similar long-lasting but accolade-lite show in Melrose Place). This causes it to fall off a cliff with Neutral AIRS, where it ranks with the similar That ’70s Show and Full House, long running comedies without high ratings or awards. The only inductees it rates better than have almost 200 fewer episodes. It’s a borderline case, but at least on the statistical side it is a no. Angel is exactly the kind of cult show that does not reflect well in AIRS, much like how Sarah Michelle Gellar scored poorly in ACTOR. It relies totally on episodes, which is why it is so low in Neutral AIRS. In fact, it ranks so low in Neutral AIRS that I only included the shows it was tied with, because the surrounding groups had so many ties among those at the bottom of the ranking. Your personal feelings on the series will dictate your vote here, but statistically it’s definitely a no. As we have seen in past months, AIRS absolutely cannot handle the small episode counts of British series. 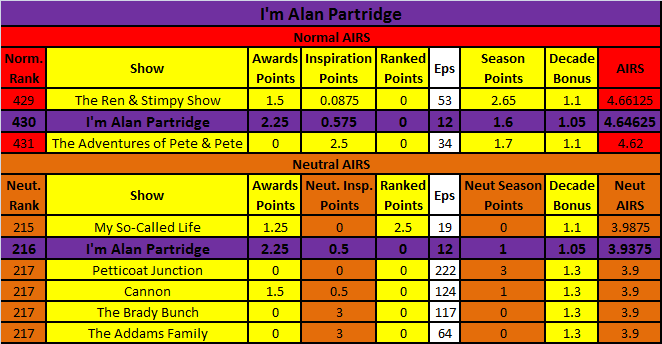 That explains the nearly 200 spot difference in ranking for I’m Alan Partridge in AIRS and Neutral AIRS. When episode count is considered, I’m Alan Partridge ranks with Nickelodeon series that, barring a network-specific theme month, would not likely be considered Hall of Fame material. 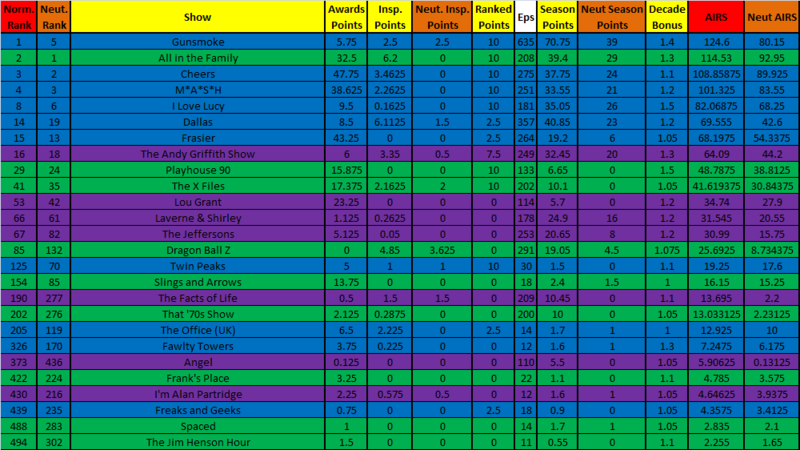 But when episode count is ignored, however, the show jumps up to where it is compared to one season wonders like My So-Called Life and long running but award-less classics like The Brady Bunch (itself a spinoff specialist). I’m Alan Partridge still falls a bit short of the standard, but with the episode neutral stat, it is certainly worthy of consideration. So, to sum up, statistics show that The Andy Griffith Show, Lou Grant, Laverne & Shirley, and The Jeffersons are Hall of Famers, while The Facts of Life, Angel, and I’m Alan Partridge fall short. Who are you voting for?